Posted on June 9, 2017 by First to the Finish Inc. So much goes into training for the big event: time spent on the track, conditioning, hard nutritional and health choices are made. You make training the priority and envision success, the glory of first place through literal blood, sweat, and tears. If you have done all this, and yet do not have the proper track and field gear and running shoes, then all the effort you have put into training could be compromised. Though proper fit and wearing a shoe specific to your gait nuances is important, when you buy your track and field running shoes, you must buy shoes with the proper spikes. Having the proper spikes can literally be the the difference between being first, or seeing the back of the first place winner. Finding shoes with the proper spikes doesn’t have to be difficult. Here are the various types of spikes and their uses. As a general rule, when you are buying spikes, the spikes that you need for long distances will have flatter and less aggressive profile shapes; those spikes that are for short distance will have a sharp profile. The type of material you will be running on will also affect what kind of spikes are both allowed, and will give you the best traction. Pyramid spikes are exactly as they sound, pointed and usually rounded on the sides. The most common used size is ¼-inch. These spikes can be used on outdoor and indoor tracks. Pyramid spikes are most like the very first track spikes that were invented in 1890 by Joseph William Foster, founder of Reebok. These spikes are generally used by long distance runners. Needle spikes are great for rainy track conditions and work the best for lightweight runners. 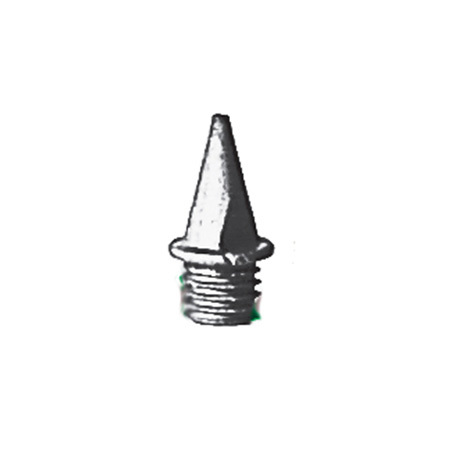 Though these spikes can give greater traction, you must be careful if you use these, for they can dig in too deep, and cause the runner to slow down. Needle spikes are generally 3/16-inches in length, but longer spikes can be found in ¼ inch and ⅜ inch. These spikes are also considered the the best for sprinting, because they are generally located on the toes and can help keep the runner’s foot pointed forward. Christmas tree spikes are not as popular as needle spikes. The staggered profile of these spikes can help the runner have proper traction without sticking too deeply into the track. These spikes are illegal on some tracks due to the concern of ripping up new tracks. These are also called compression spikes. When you are using track and field running shoes with spikes, you may want to invest in other related gear, such as a spike wrench: spike wrenches can help you tighten your spikes if needed, or replace missing or damaged spikes. Before you invest in spikes and other related track and field gear, be sure to ask your coach what they would recommend; remember, the type of track, the event you are competing in, Mother Nature, your weight, and your preferences affect what type of spike you should buy, as well as your experience level. If you are looking for quality track and field gear to take your game to the next level, shop First to the Finish’s online store. We have track and field running shoes, apparel, and much more!